Some similar factors apply to cycling. 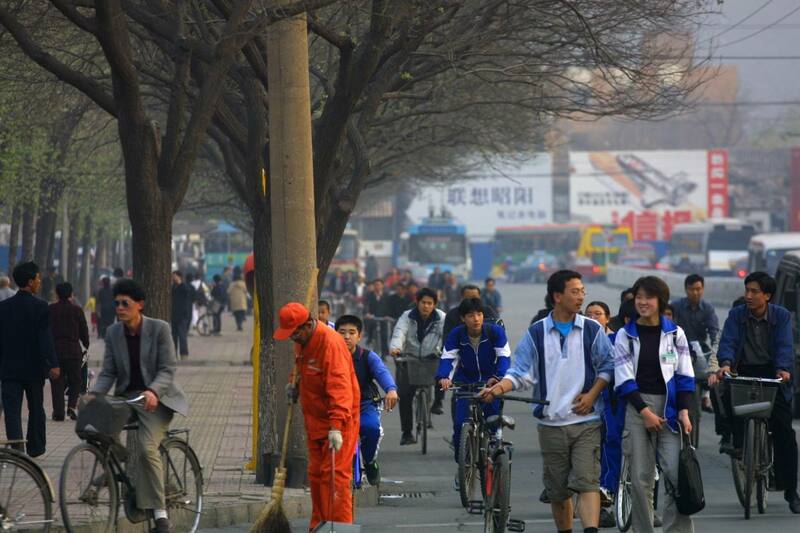 In a lot of the world, people bike because it's much cheaper and they can't afford a car. In the richer countries, most people can afford cars, but people bike because they enjoy it, or seek the exercise. They may also wish to avoid traffic, take routes only bikes can take, or avoid burning gasoline. Bicycles on demand offer the chance to cycle just when you want to. This could increase by quite a bit the times when you actually would cycle. Just like it does for walking, the multi-mode, multi-leg trip becomes enabled. For example, I often find I drive to Google, and then to Nasa which is 2.5 miles away, and then back home. The 2.5 mile leg is ideal for cycling -- there's even a bike trail for much of it -- but I can't do this. First I would have to always bring my bike. (While Google does provide bikes, they are tiny single-gear bikes not meant to leave campus.) I could do the round-trip to come back and get my car, but that's less convenient and can hit some nasty traffic patterns -- traffic in and out of Google at rush hour is very bad. This is a personal example, but I am sure you can all think of examples from your own life where you take an intermediary trip today (in your car) of a few miles that might be very nice for biking. Weather is another impediment to biking. When I used to bike commute, I would drive instead if the forecast called for rain in the afternoon, even if it was nice in the morning. With robocars I could bike in, and ride back. Bike delivery means choice of bike. Recumbents are hard to carry in cars, but no challenge for a custom bike delivery robot. They are more comfortable to ride and faster on flats and downhill. You could even climb a hill in a diamond bike and descend in a recumbent. Or, let's face it, you could also have the cheater's option of climbing the hard hills in a car, or with power assist, and riding alone when going down or traversing flatter terrain. That might be a cheater's option, but it would get more people cycling. Your gear could shadow you in a small cargo robot. The robocar also offers easy transportation for you, and your bikes, to the places where it's fun to bike. Get driven to the coast, then bike it, then get driven back from your endpoint. Or bike the "interesting parts" and drive the boring (or difficult) ones. The main issue? At least at first, a human will need to be there to put a bike into a bike-delivery robot or clamp a bikebot on the bike. That means you must declare your destination in advance, with enough time to get that robot to that spot so you can hand over the bike. Perhaps in the future, there will be robots that can pick up a waiting bike without a human to help. Quick one-way trips will probably not be with your personal bike, but rather a rental. While there are those who insist on their personally chosen bike for long rides, most people can tolerate a quality rental bike for a quick urban leg. Trikes, which are super easy to ride, can also be offered, and even bikes and trikes with motor assist when you want the non-exercise advantages of a bicycle could be provided. Cycling could also be great for commute times. Many commuters might be happy to get a ride (perhaps even in groups) to the outskirts of the CBD, but as they enter the congested zone, have their car drop them off next to a bike for a quick ride to work. Long enough to get some exercise but not long enough to need a shower. This does present a problem when it rains and everybody wants to ride all the way in, though. In the less developed world, where the bicycle is the transportation of choice due to cost, the robocar will take away some riders as it offers lower-cost transportation, protected from the weather, without up-front investment. However, eventually the above factors from the developed world will bring people back to the bicycle even though they can afford the car. 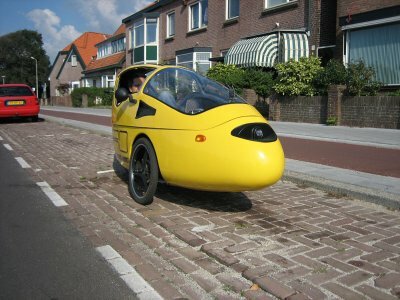 A self delivering electrical scooter with a gyroscope, intended to keep the vehicle in the vertical position, which also can work as a flywheel storing mechanical energy of recuperation..
Why not just ride your bike to Google in the first place? How far do you live from Google, 10 miles? Why not just ride there in the first place?! Maybe I'll just cancel from cell plan and have the robocar bring me DVDs with my email on them.